So let’s dive into the second week of our Arctic Thematic Unit! Didn’t get a chance to read about our first week? Check it out here! So after my students had a solid foundation of how harsh the Arctic climate can be, we began to study different animals that can not only live in this regions, but thrive! The first animal we studied was the snow leopard. 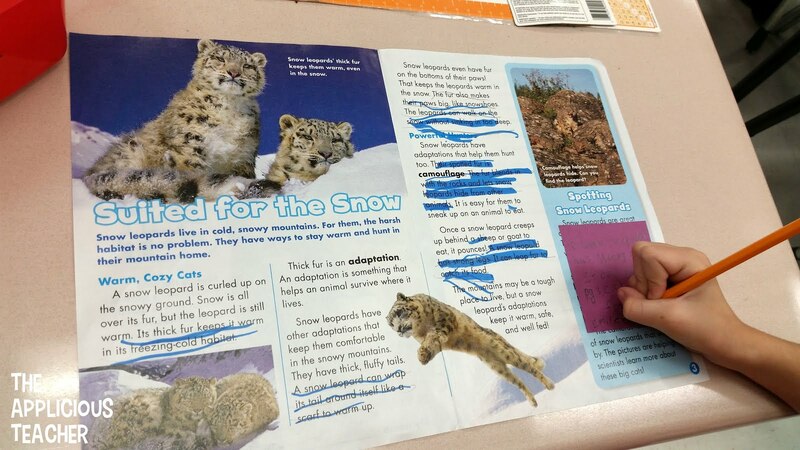 Scholastic News had a great edition in January on this arctic feline’s amazing adaptations! As we read, we highlighted some of the adaptations the leopard had that helped it live in the cold.The next day we studied the arctic fox. We used an article found in the Sticky Notes and Glitter’s Arctic Animals Prove It! pack. As we read, we highlighted the different ways the fox has adapted to arctic life. Then, we worked to compare and contrast the two text. Students recorded the ways the two animals were alike and different in their Reading Response Journals. In our literacy stations , we got creative and sent postcards to our families as if we were visiting the Arctic. 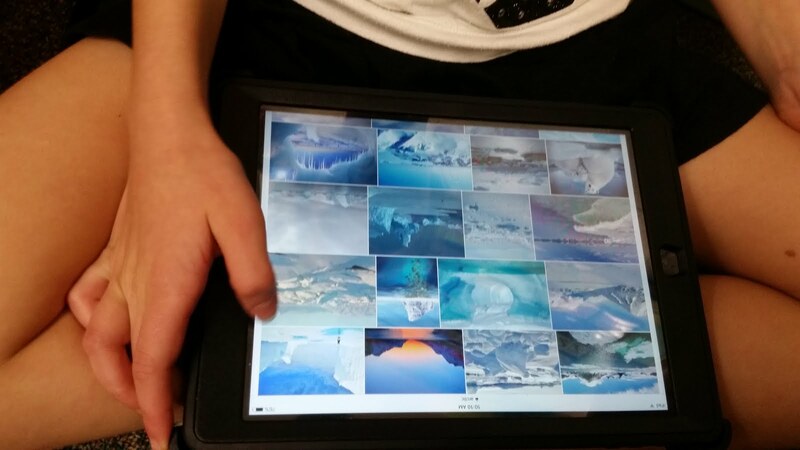 The students used an image search to find arctic photos. Then, screenshot the perfect pic. Once it was in their camera roll, students imported it into the the app and got to work. This was def a fave! We used an app similar to this one! 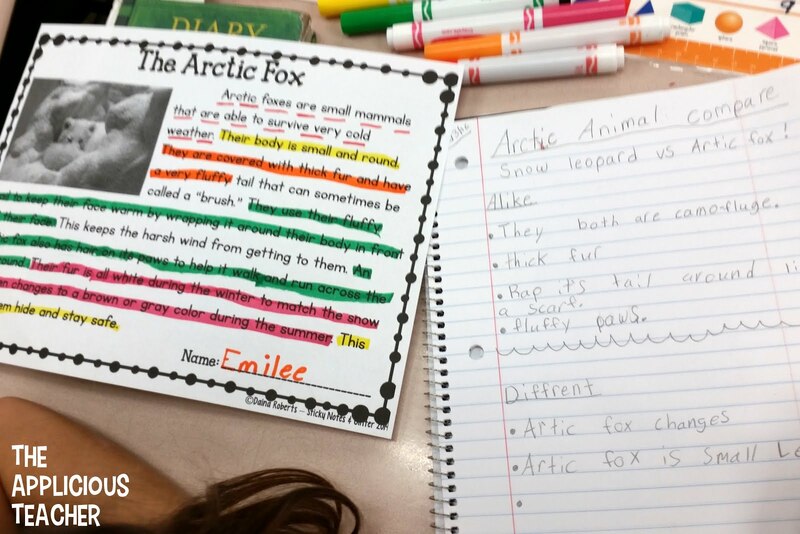 For writing that week, we worked on researching more information about an arctic animal. To get started, the kiddos chose an animal they were interested in learning more information about. I allowed my penguin lovers to research them even though those cuties live on the opposite end of the Earth! We used the totally kid friendly Google Jr. search engine to help look up information. Thank you Google, you literally answered every elementary teacher’s prayer! Some students really wanted to research the same animal- which I totally preferred! This allowed students to work together to find information, freeing me up to help those who struggled with looking for key details. After the students finished, we presented the information in triangle groups. This was such a great way to build our vocabulary, research skills, and presentation skills. You can grab the research paper I used here for FREE! I was even able to sneak a little arctic fun into our math block! I don’t know about you, but my kiddos still needed help with solving word problems… so I pulled out my Winter Themed Word Problem Task cards. I’ve got some on IEPs… some who are *almost* there, and some who are ready to take off in our addition and subtraction unit. These cards are differentiated so I was able to tailor the cards perfectly to my kiddos needs. Some were working on 2 digit addition, while I had a few others working multiple step problems with 3-digit addition AND subtraction. I know a few of my students are biting at the bit for multiplication, so I’ll pull these cards out in a few weeks for them! At the end of the week it was time to assess some of this learning we had been doing! Our main focus was on comparing texts on similar topics, so I used this arctic animal themed assessment. It was the perfect ending to our arctic fun! You can grab this assessment HERE for FREE, too! Like what you see? 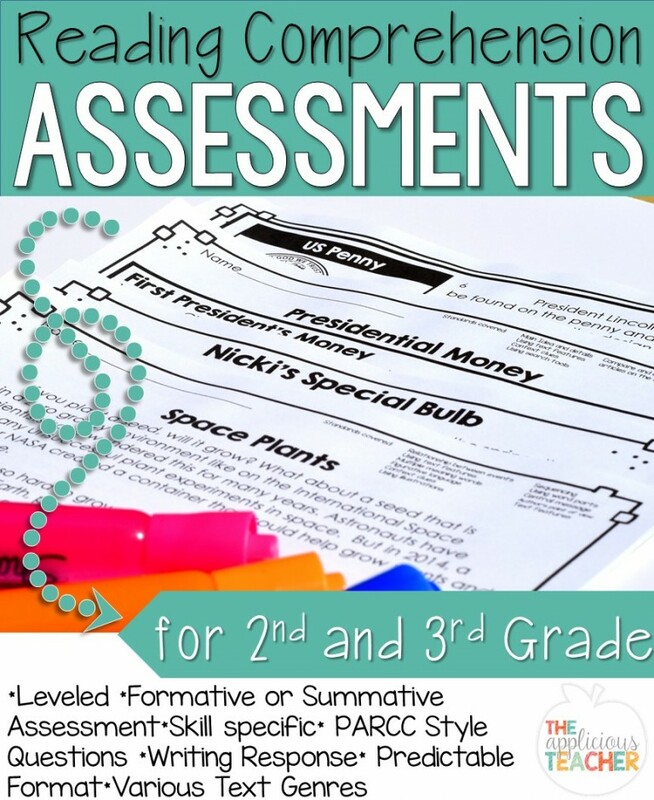 Check out my Reading Comprehension Assessment Packs for 2nd and 3rd grade! Now it’s time to warm up with some hot chocolate and a good book! This teacher is T.I.R.E.D!